Nico Rosberg is closing in on F1 world championship leader and teammate, Lewis Hamilton, who is now only 10 points in the lead after Rosberg snagged a dominant victory at the Austrian Grand Prix. 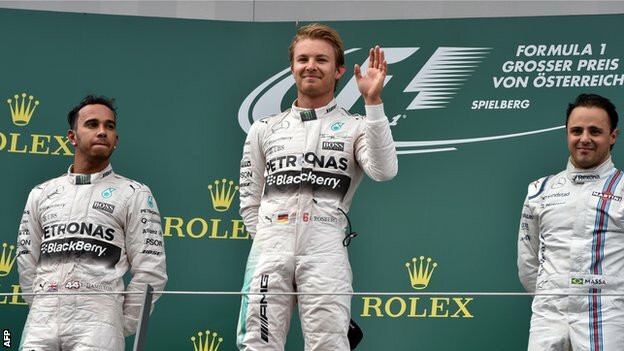 Hamilton took the pole during qualifying, but Rosberg quickly snatched the lead from him at Turn 1. Hamilton’s attempt to reclaim the lead in the same lap was thwarted when the safety car was triggered by a great crash between McLaren’s Fernando Alonso and Ferrari’s Kimi Raikkonen, sending both cars into the barrier and out of the race; Raikkonen appeared to have lost control while Alonso was racing abreast on the outside. Both drivers walked away unscathed, but Alonso did pay a visit to the medical centre. Investigations by the race stewards afterwards found no further action required. Team McLaren was really down on luck at the Spielberg circuit with Alonso’s updated car retired, followed by Jenson Button being retired as well, for the second race in succession, when his engine failed 10 laps in. After the two Mercedes went for their only pit stop, Hamilton rejoined the race after Rosberg, but incurred a penalty for going over the white line separating the pit exit from the race track, adding five seconds to his finishing time and putting victory firmly out of his grasp. Mercedes was expecting real competition from Ferrari, especially with Sebastian Vettel topping the Silver Arrows during practice, but Vettel was left behind by the Mercedes duo during the race. The German then ran into issues with his right rear wheel during his pit stop, forcing him to surrender third place to Felipe Massa and giving the Williams driver his first podium finish of the season.